Das bifa Umweltinstitut beschäftigt sich im Rahmen des EU-Projektes Ecosolar zusammen mit anderen namhaften, europäischen Institutionen mit Solarmodulen. Europe wants to reduce its needs for raw materials and raise the level of recycling of resources in the solar power industry. If this project is successful, greenhouse gas emissions from solar panel manufacture will fall by 25 to 30 per cent. “Our aim is that the solar cell industry should utilise materials that would otherwise end up on waste sites once solar cell panels are disposed of. We also want to make it possible to produce solar cell panels using less raw materials than we currently do. These are the words of SINTEF scientist Martin Bellmann, who coordinates the recently launched European Union project Eco-Solar. The project focuses on how the entire value chain in today’s solar power branch makes use of resources. Reusing materials and reducing the consumption of raw materials will make solar cell panels both cheaper and greener. When less new materials are needed, the emissions of greenhouse gases from their production will decrease. Likewise, the energy consumed by these processes will be paid off faster than it is today. All this should improve market penetration for European producers. “The overarching aim is to strengthen European companies who are driven by innovation and who are able to secure Europe's power supply in a sustainable way” says Bellmann. The aim is to reduce the consumption of raw materials by which the carbon footprint will shrink by 30 per cent for panels using the more common type of solar cells, which are known as multicrystalline cells. 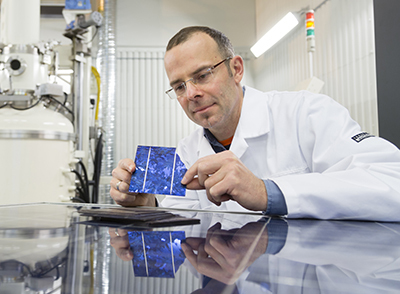 For panels made of the most efficient – monocrystalline – cells, the corresponding reduction is 25 per cent. These objectives are to be reached via a wide range of technological measures (see Fact-box 1). A further aim of the project is to develop a solar-cell “doctor”: a fully automated system capable of identifying defects in finished cells and repairing those that are capable of being rescued. This is intended to ensure the best possible performance of panels once they have been installed on the premises of clients. The project started in October 2015, and will continue for three years.